GRAND CHUTE, WI - The Wisconsin Timber Rattlers need some new team members for their new season! If you are fun-loving and ready to get to work, you could be part our game-day staff for this season. 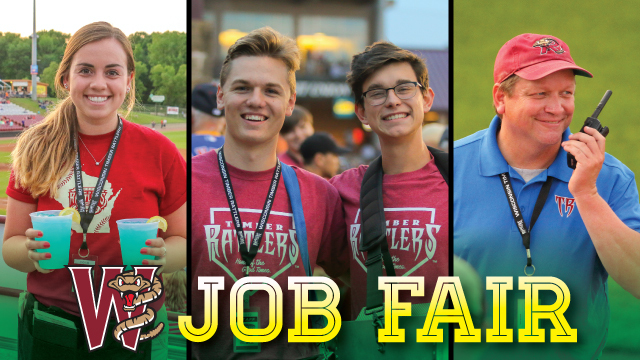 The Rattlers are hosting a Job Fair for prospective employees on Monday, February 25 from 4 p.m. until 7 p.m. in the Fox Communities Credit Union Fox Club at Neuroscience Group Field at Fox Cities Stadium. Custodial Crew - Responsible for cleaning the stadium following games, special events, banquets, etc. and as needed throughout the stadium. Snake Pit Team Store - The Timber Rattlers merchandise store is in need of helpful workers. Security - Responsible for fan safety. Must be over 21, with some experience. Ticket Sellers - Prepare and sell all game day and advance tickets via phone, mail, and window with an emphasis on efficiency, accuracy, and service. Responsible for all accounting of ticket inventory, including coupons, vouchers and promotional tickets. Computer literate due to ticketing software. Ticket Takers - Scan tickets and welcome fans as they enter the ballpark. Ushers - Responsibilities include pre-game prep, greeting and assisting fans to their seats, watch crowd for problems or injuries during game, assist fans safely out at the end of the game. Kitchen managers, Cooks & Kitchen Staff - Primary responsibilities include planning, preparation and cooking of meals for baseball games, banquet events and special events. A basic understanding of the food service industry is preferred but not necessary. These individuals will need to be available for both day and night baseball games during the week and weekends so a flexible schedule is important. Availability starting in April. Servers - Looking for those who are interested working PM's and weekends but availability during the daytime is a plus. Must be 18, with some server experience. Completion of liquor license course a plus but not required. Availability starting in April. Bartenders - Flexible with hours, but primarily looking for those who are interested working PM's and weekends. Availability during the daytime is a plus. Must be 18, experience preferred but not required. Must complete liquor license course in order to sell beer. Availability starting in April. Hawkers - Must be able to carry 50+ lbs. up and down stairs. Looking for workers 18 years of age and older, but exceptions may be made. Must complete liquor license course to sell beer. Availability starting in April. Picnic Staff - Must be able to lift 50+ lbs. with help of others on staff. Looking for workers 18 years of age and older, but exceptions may be made. Availability starting in April. Picnic Lead - Individual must be able to successfully run picnics throughout the stadium. Food & beverage experience required along with understanding of buffets. Must be available majority of games throughout the season. Availability starting in April. Concession Stand Server - Responsible for the distribution of food and beverage out of concession or kiosks. Must be able to work day games, must be 18 or older. Concession Stand Register Operator - Primary responsibilities include taking food and beverage orders, cash handling, and customer interaction. Must be able to work day games, doesn't necessarily need to be over 18, and should be comfortable on computers. Concession Stand Runner - Individuals are required to keep food and beverage product replenished during baseball games. Required to lift half barrels (161lbs) on occasion. The job also includes frequent walking and standing for extended periods of time. All concession positions are primarily nights/weekends but have 1st shift hours available occasionally. Job seekers are encouraged to fill out their application before arrival at the job fair. Applications are available at the Timber Rattlers Front Office, or a downloadable application can be found online at this link to the Timber Rattlers website. Applicants must be at least 16 years of age by April 6, 2019. Interested applicants should come prepared to interview with a Timber Rattlers staff member and bring a photo ID and Social Security Card. Applicants should be energetic, friendly, and dependable, and look forward to contributing to the welcoming atmosphere of Neuroscience Group Field at Fox Cities Stadium. The Timber Rattlers offer a fun-filled atmosphere and a unique employee experience for the summer months. The Rattlers are an equal opportunity employer.